Major League Soccer (MLS) side Seattle Sounders have signed experienced Nigeria defender Onyekachi Apam, subject to international clearance. 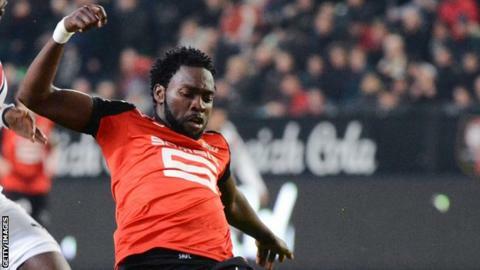 The 27-year-old arrives on a free transfer after his contract with French club Stade Rennes was terminated by mutual consent in January. Apam moved to France in 2005 from Nigeria's Enugu Rangers. He made 128 appearances in top flight football in France for Nice and Stade Rennes. "Onyekachi brings vast experience from French Lique 1 and the Nigerian National Team," said Sounders FC Sporting Director Chris Henderson. "He is a versatile defender who can play central or wide and has the ability to start our attack from the back as well." Apam, who has 14 caps for the Super Eagles, has endured an injury-plagued four years, but made an impressive recovery to earn a deal with Sounders. He will be counting on a compatriot for support at his new club in the form of Nigeria striker and club top scorer Obafemi Martins. The versatile Apam has not played for his country since the 2010 Africa Cup of Nations in Angola. He was an integral part of the Nigeria squad that won the African under-20 title in 2005. The same year they got to the final of the 2005 World Youth Championship in the Netherlands where they lost to Argentina 2-1. He was also regarded as the heart and soul of the Nigerian defence when they won the silver medal at the 2008 Olympics in Beijing, where they once again lost to Argentina 1-0.